Today, we have a superb article from Charlotte Weychan, also known as The Galloping Gardener, who travels the world reviewing and photographing gardens. We invited Charlotte to come along to Hampton Court Palace Flower Show to get her expert opinion on the show. The weather gods were smiling on Hampton Court Flower Show this year and for once the only umbrellas to be seen were those used to protect milling masses of garden lovers from the searing July heat. Decked in as little as possible, given the forecasters’ warnings of a heatwave and topped and toed in straw hats and open sandals, rather than wellington boots, the eager crowd was quick to recognise what a difference it makes to look at bumper-sized alliums and ebullient meadow-style planting in brilliant sunshine, safe in the knowledge that you’ll remain dry while enjoying the show. 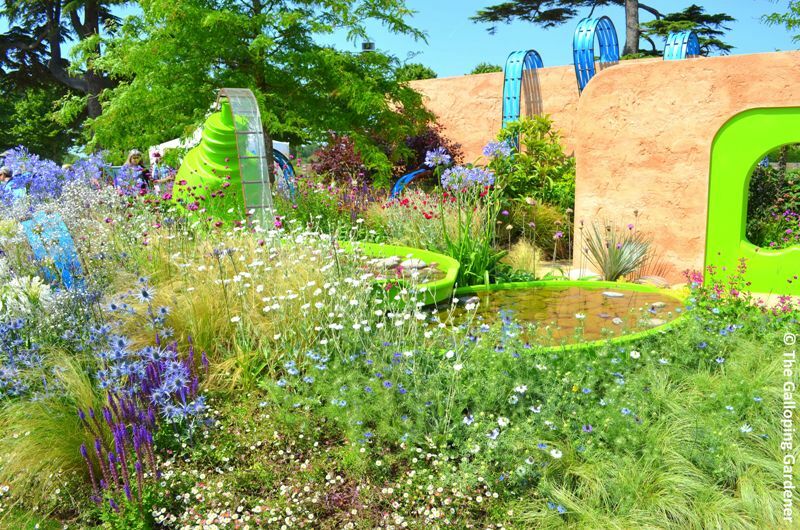 Hampton Court is very different to Chelsea and the emphasis is on gardens for the man in the street rather than the surfeit of high-cost and hugely impractical dream gardens at the annual RHS flagship show in central London. People come here to gather ideas and you’ll hear comments like: “we could do that at home”, and most tellingly: “we could afford that”, rather than the stupefied silences of onlookers at Chelsea. Keen gardeners can buy anything from footwear to fine garden sculptures at RHS shows, but I suspect that sales of the former were down at Hampton Court last week, while champagne and ice-cream sales soared to record highs. The most popular item on sale seemed to be the collapsible shopping trolleys on wheels, sported by the majority of visitors – great for their purchases, but terrible for the back of dawdling legs ahead of them! My bruised legs are testament to the number of bumps from behind while wandering around this year’s show! Also noticeable was the absence of huge crowds in the main marquees because show-goers didn’t need to take cover from the rain. 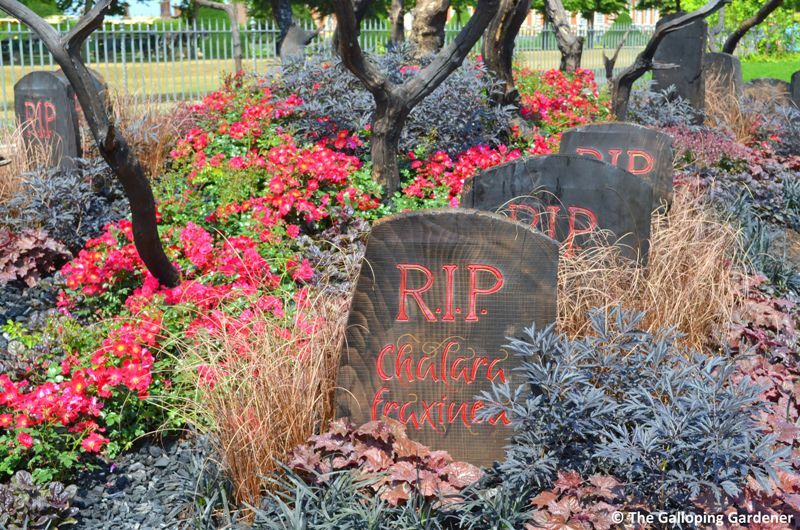 Floral and edible food displays were as stunning as always, but understandably, many of the paying punters were more interested in the outside exhibits, in their search for ideas to improve their plots at home and take advantage of the unusually hot weather. As always, the display gardens at Hampton Court were divided into different categories, with the Show and Summer gardens drawing huge crowds of visitors in search of ideas for the home. 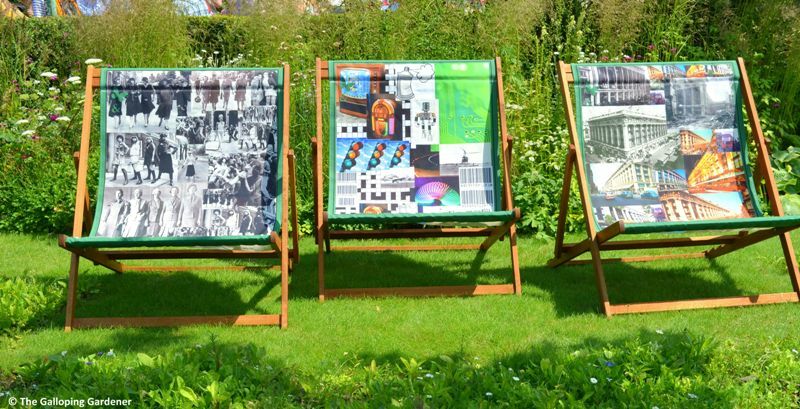 Chris Beardshaw designed ‘The McCarthy and Stone Garden’, which attracted a lot of attention – particularly the oversized deck chairs. 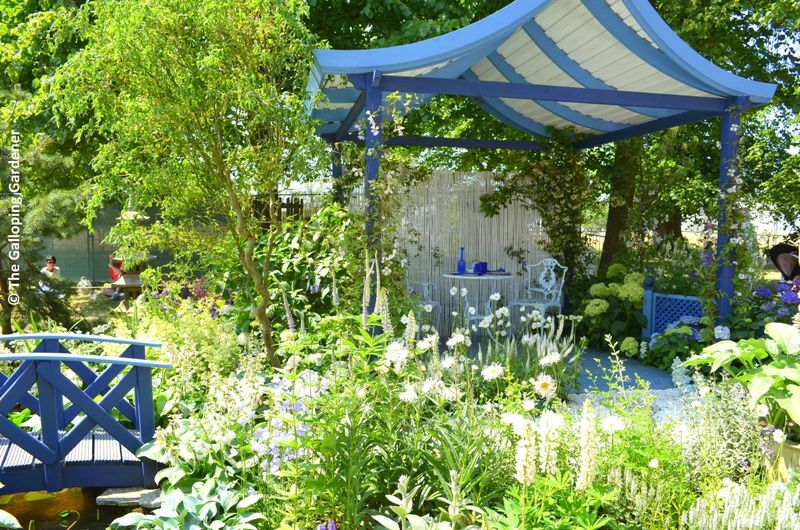 There were also some charming smaller gardens including ‘Willow Pattern’, with its strong emphasis on blue and white planting inspired by the plates that so many of us see in antique shops. And the Ecover garden, where the theme was sustainability, was equally memorable for its collection of giant-sized biodegradable plastic bottles popping out of carefully orchestrated high-summer planting. 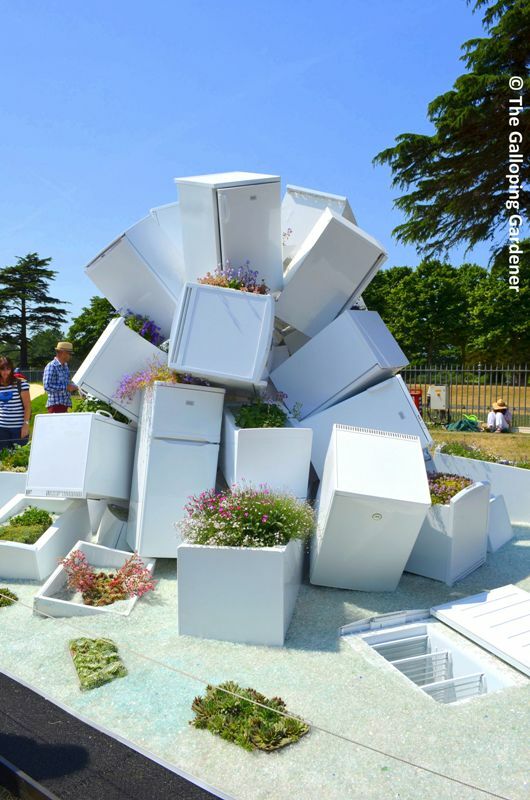 This is the RHS show renowned for its controversial “Conceptual” gardens. Heat and the changing climate were certainly major features in this year’s exhibits and visitors were startled by ‘Tip of the Iceberg’ featuring a pile of fridges, with a sparse scattering of alpines; and either amused or alarmed by the man in a gas mask taking centre stage as a fixed exhibit in an armchair at the Metallica inspired “I Disappear” garden – he did have an umbrella to protect himself, but many of us wondered how he survived the stifling heat! ‘Ashes to Ashes’ provoked many different emotions in spectators, although it was certainly one of my favourites. The underlying theme here was the devastating dieback of ash trees in the UK recently, but with hope expressed in the form of the circle of fledgling elm trees at the far end of the garden, since they had also previously faced extinction here in Britain. 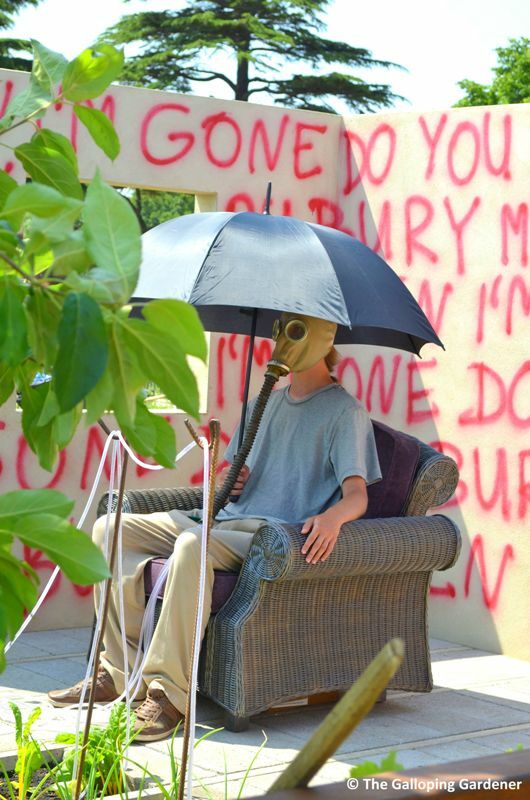 ‘Desolation to Regeneration’ was another Conceptual garden with a strong message, offering visitors the chance to walk through the garden and see, hear and smell the effects of forest fire. There was little doubt looking at the smiling faces of visitors that Hampton Court was a great success this year – it didn’t seem to matter that you had to queue for drinks or food, or that certain exhibits had long lines. For once, the weather had triumphed here in England.